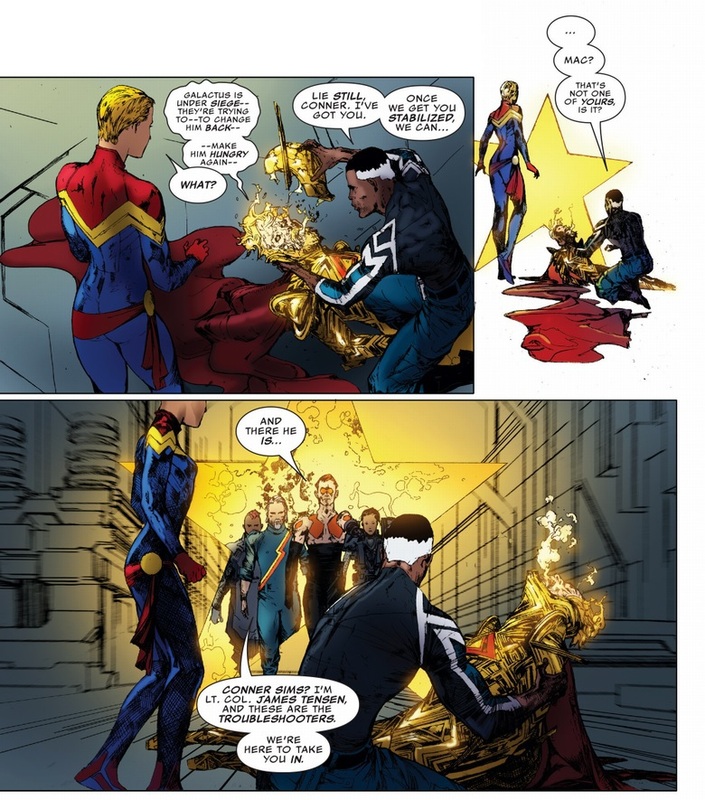 scans_daily | The Ultimates Squared #3 - "Bad Moon Rising"
This can only bring good things! He changed into a Final Fantasy final boss. That or a Bayonetta regular boss. Wings, arms, and faces! The more the better! Sounds like the instructions in a "Build your own Titan" kit. The Hundred-Handed ones approve. Can't be the only one thinking it. Y'know, the more this goes on, the more it seems Voght is not Up To Something, but is just a guy with an unfortunate job he has to do. It's almost, but not quite as creepy as that thing up there, if only because Voght is human. Still, that "I fear winter" bit sounds slightly manipulative. So there's hope. Or, ah, the opposite, really. 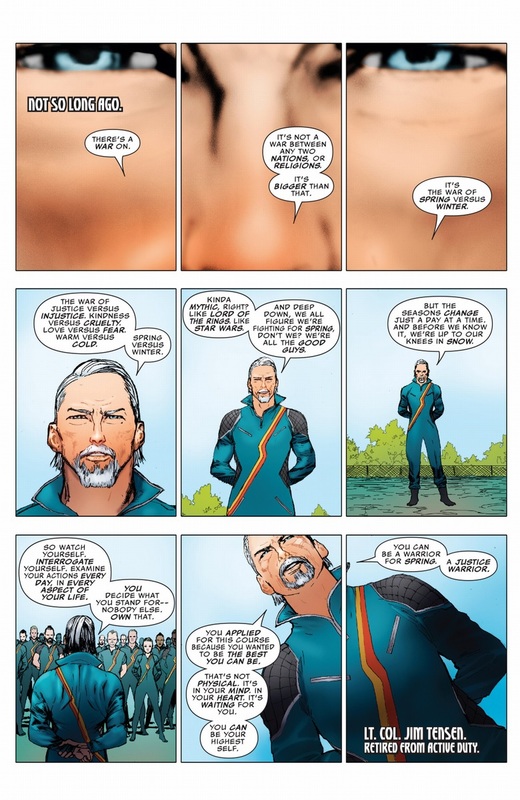 Also, props to Ewing for continuing the running thing of "New Universe characters, but with the names slightly tweaked" Hickman introduced. 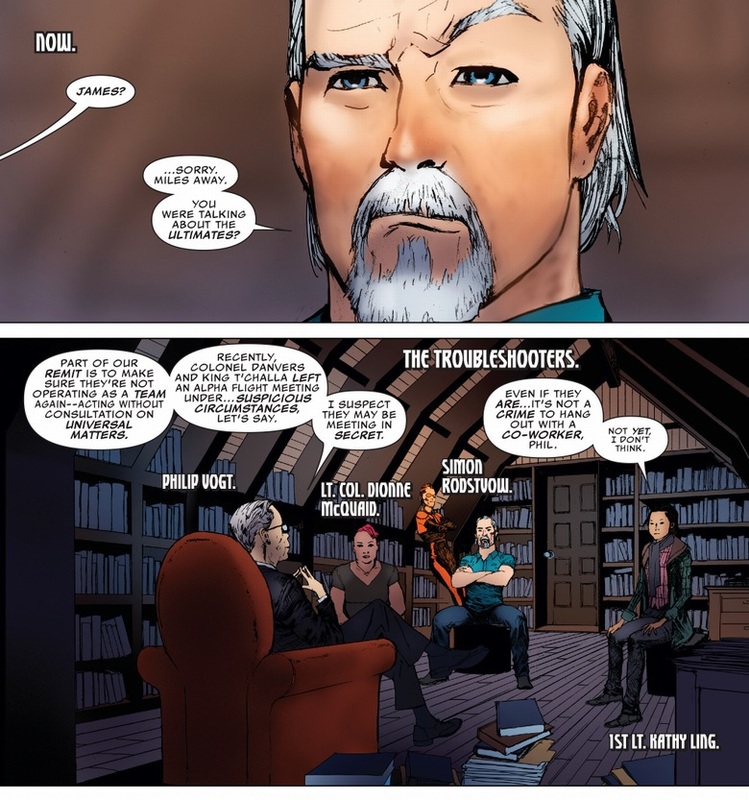 Also also, props to Ewing for remembering the New Universe. Man must be cheating at this point. Also also also: Tensen fears winter. This story takes place at X-Mas time. The key to killing Logos quickly is killing the right side first, because it heals and can revive the other parts. 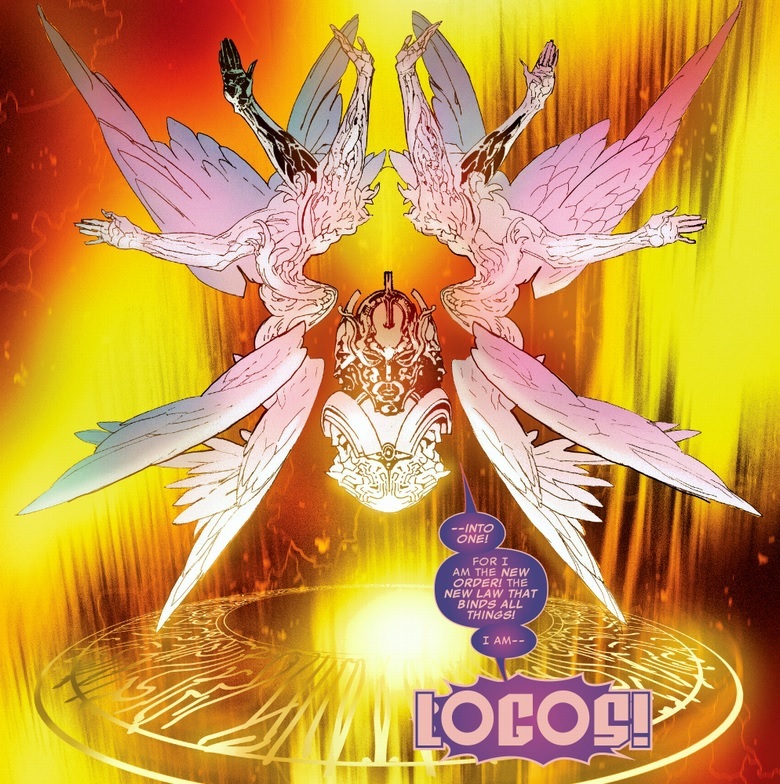 Logos comes with his own logos, I see. I feel like for everything people complain about Nick Spencer doing wrong, Al Ewing is there as a counterbalance. I fail to see why they keep referencing New Universe names (apart from changing the spelling slightly in some cases) for characters who have bugger all to do with their original versions. Same-ish name, vaguely similar character. 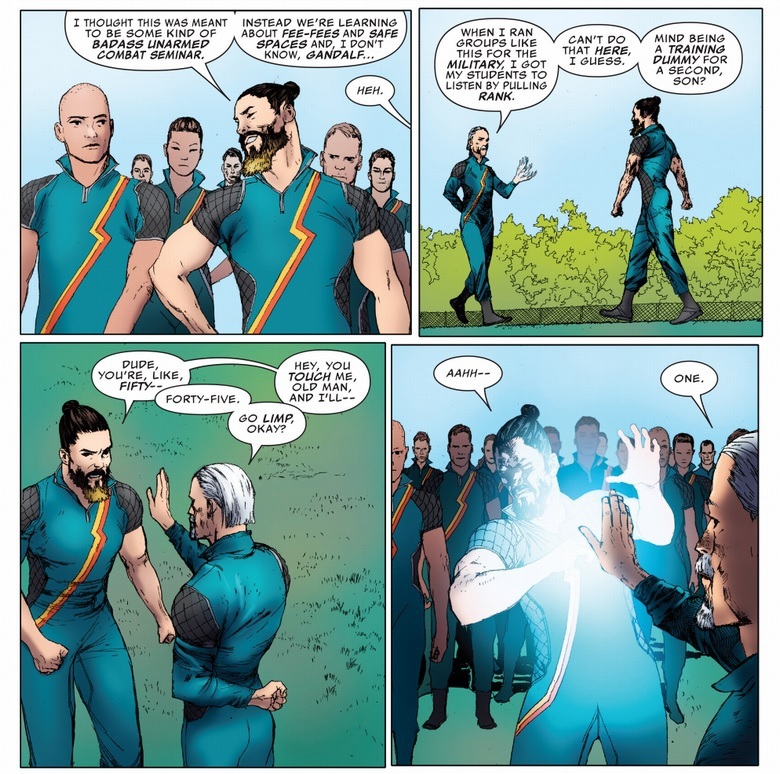 It's just picking up what started in the Avengers run that led into Secret Wars- there, we got Kevin Connor, the Starbrand of 616. Think of it this way: Earth-2 has reincarnated Egyptian pharaoh Carter Hall, Earth-1 has alien policeman Katar Hol. Does that mean Earth-1 was the Ultimate universe before the Ultimate universe? The last panel would be a kickass album cover. 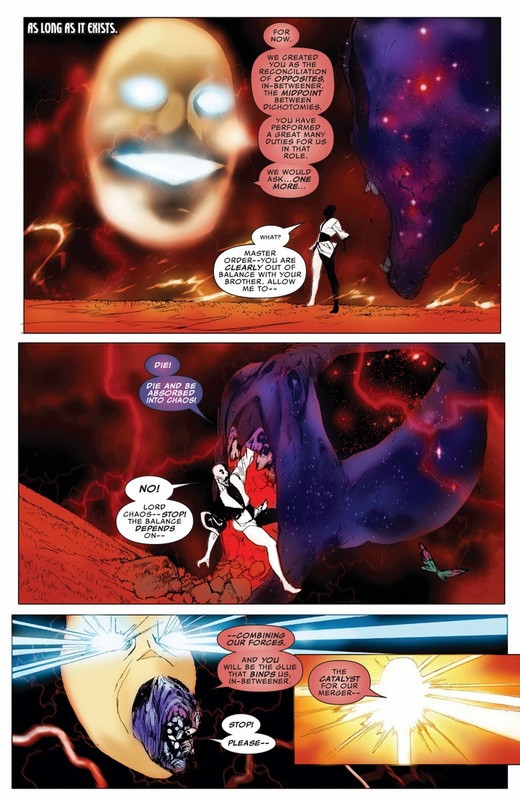 In their defence, the Celestials were nearly wiped out beforehand by the incredibly bland and pointless Beyonders. 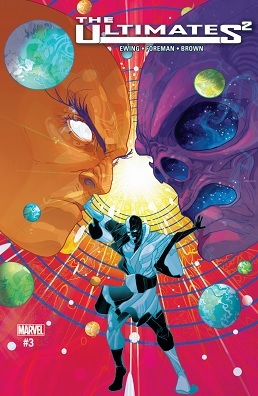 And [SPOILERS] the next issue has Galactus suggest Order's not himself at the moment. But hey, Infinity's doing alright. And the Never-Queen's all fine and dandy. No word on Oblivion or Origin or those other folk. Oblivion seems to be okay. 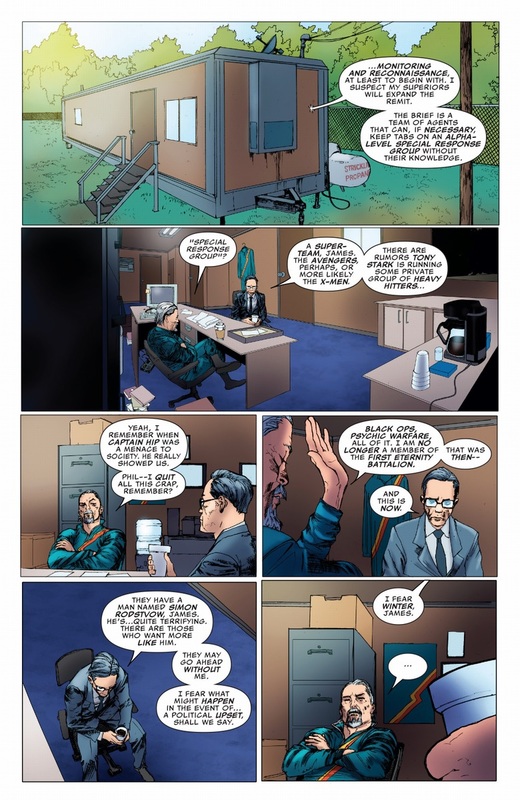 He's shown up in the GLA comic, after Doorman for not doing his Deathurge job. I get the feeling Death will be benefiting quite a bit from the new status quo. 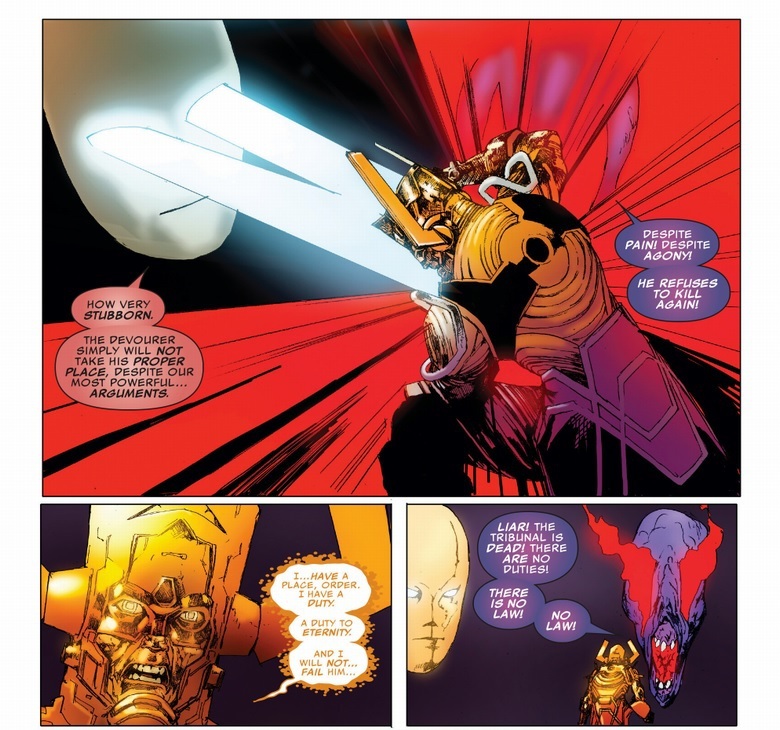 Wonder what Jim Starlin thinks of Adam Warlock/the new Living Tribunal being disintegrated about 5 minutes after his apotheosis? Knowing Jim Starlin? He'll probably feel the need to write another STIRRING EPIC about Thanos "fixing" everything because he's Thanos and he's great and everyone else is dumb. 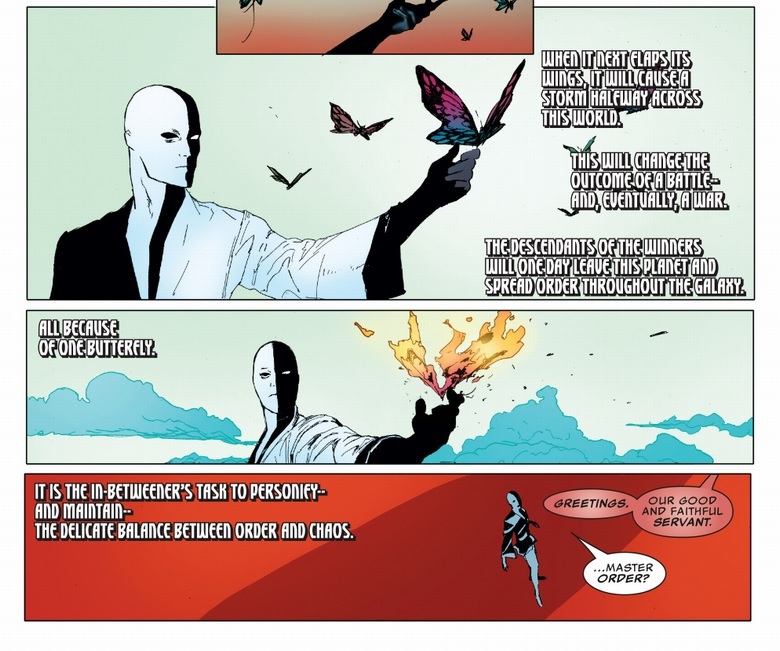 Weren't Order and Chaos always jerks though? I had thought I remembered the two of them as being on the more benevolent end of the spectrum, but I could be wrong.